When first launched, the Yamaha YZF-R15 was one of the best 150cc sports bike your money could get in India. The next generation (V3.0) continued the legacy and was more sportier than its predecessor. However, competition began to growl and with the likes of KTMs biting on its heels, the V2.0 was outclassed. Yamaha has finally responded with a new version of the YZF-R15 – the Version 3.0. But how does the new bike fare with its predecessor, the V2.0? 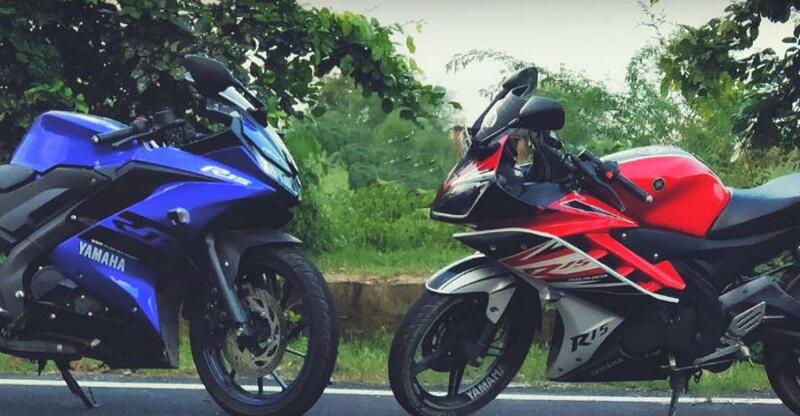 For that, today we bring you a drag race video between both the generations of the R15. Take a look. The video starts off with a short channel introduction after which we see both the bikes lined up on the tarmac. The red bike is the V2.0, while the blue one is the V3.0. After the launch signal (bike horn in this case), both bikes get a good start and race off into the long tarmac stretch. This video has two parts. In the first part, we see that the R15 V3.0 wins the race. It developed a lead in the beginning which only grew later on. Better engine and dynamics could be attributed for that but more on that later. In the second part of the video, we see both the riders interchanging their bikes and getting into positions again. After the launch signal, both the bike shoot off again and we see the newer model gaining ground again. At the end, we see no change in the results, reflecting that the V3.0 is indeed a better bike. Talking about the Yamaha YZF-R15 V3.0, it’s almost an all new bike and currently has one of the most powerful 150cc engines in the whole world (stock engine). It now gets a more powerful 155cc engine (18.7 Bhp, 15 Nm), which is a significant upgrade compared to the previous model’s 149cc motor (16.7 Bhp, 15 Nm). Other significant technical changes include the inclusion of VVA (Variable Valve Actuation) and slipper clutch, to name a few. It also gets an all digital instrument cluster, larger brakes and suspension, a more ergonomic design and lower pillion seat with grab rails. Not to forget that it is also more fuel efficient now, thanks to various technological advancements incorporated in it. The R15 V3.0 is marginally heavier and dearer than the previous iteration, but is definitely worth it.